UPDATED 23 September 2013: For latest news scroll to bottom of this blog. Many of us watched with open mouths as the numbers of twitter followers of @notodogmeat shot up in less than 12 hours from 2k to 7k. Is it possible that they purchased a 5000 twitter followers package? 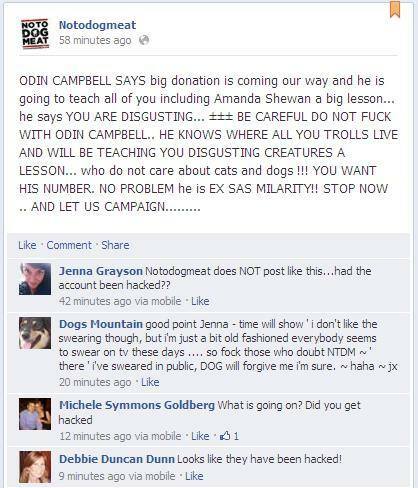 Surely an animal charity wouldn’t misuse donations from their supporters in such a ridiculous fashion? Interesting to note that these thousands of new followers seemed to have nothing to do with animals in their profile. We certainly didn’t see them tweeting in support of NTDM. 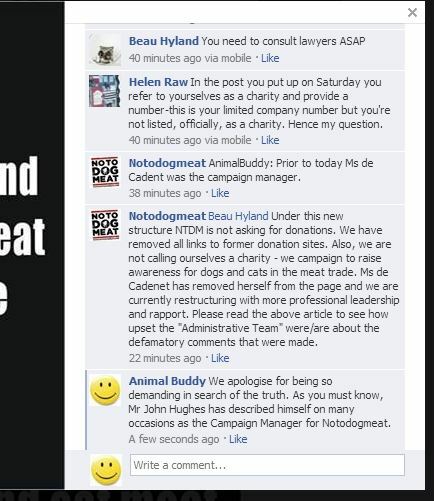 NTDM, in a hissy fit, decided to carry their obnoxious campaign against their critics back to their Facebook page. Odin Campbell is/was a fake Facebook ID used to troll and frighten critics of NTDM. A very nasty persona indeed who uses his military background in the same threatening way as Mr H. the ‘NTDM campaign manager’ used his police background in FB comments. Below are the other, now deleted, NTDM Facebook posts from yesterday. Perhaps the celebrated ‘pro bono’ unregistered ‘Barrister’ CEO of NTDM will need to dust off her law books. This kind of attack is commonly used by NTDM. They usually complain that they have been hacked or try to blame a nameless volunteer. Well their Twitter account must have been hacked at the same time? They obviously like the ‘ brown envelope’ reference too much to cover their tracks well enough. We have noticed recently that this well know FB infamous personality has been vigorously defending NTDM, seems he is friendly with Mr H the campaign manager for NTDM and owner of a Philippine rescue. Some friends an animal ‘charity’ is probably better off not having. Unless of course, you need to intimidate critics. On a final note the two women co-founders of NTDM are no slouches themselves when tweeting. 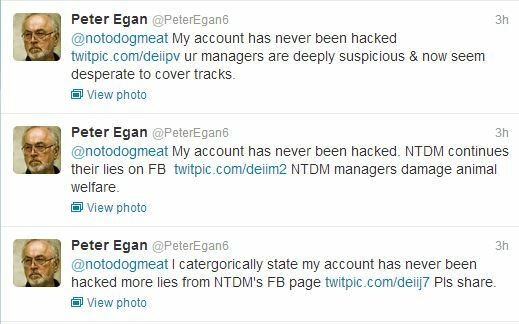 Just in….. NTDM defend their appalling ‘Facebook Page’ attack on Mr Peter Egan and their threat to set an ex SAS thug onto critics. 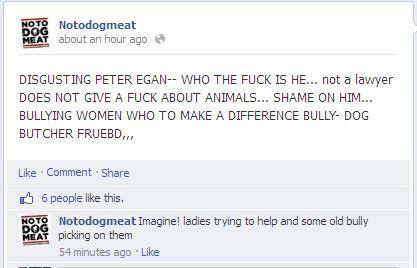 As of the 22 September 2013, and following reactions to this post, the official Facebook Page of Notodogmeat has been disabled. Their twitter account was re-launched today with a thumping 2k loss of followers in spite of a package of 5k recently added . The closure of the FB page may be temporary for ‘house cleaning’ purposes? 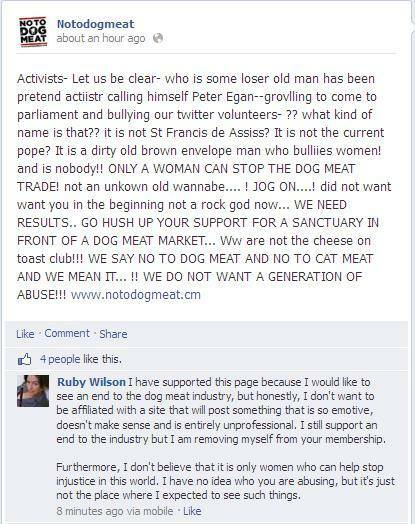 Who are the Admin responsible for the infamous recent posts on the official Notodogmeat FB page? We are no closer to discovering the answer to that question. NTDM management seem uncertain themselves? The UK police are usually indifferent to social media threats of violence and stalking so we are not optimistic about the complaint lodged with them. We do know that this is the person who tweets for them. We do know that this person has been part of the management team since the beginning. Observers have believed that she and Ms Brown, with the campaign manager Mr H who posts periodically under his own name, have admin roles on the official Facebook Page. This screen shot , of an interesting request to the Thailand NTDM Chapter, has just been posted on Twitter. NTDM headquarters requested that Sally is immediately appointed as joint admin and that the Thai Chapter place an order for T Shirts in order to be officially endorsed. Before giving your money to the ‘animal charities’ which proliferate the pages of Facebook, perhaps the question to ask yourselves is: would you buy a used car from these people? Facebook is not in the least interested in monitoring their social media pages. Complaints to FB fall on deaf ears; the reverse is true…complainants with small FB audiences often find themselves very much at the mercy of bigger Pages. The FB moderators seem to have an inexplicable agenda which has nothing to do with protecting the public from nefarious people who will stop at nothing to part us from our money. Update 23 September 2013 NTDM re-activates their official Facebook Page. DID SHE FALL ON HER SWORD OR WAS SHE STABBED IN THE BACK? 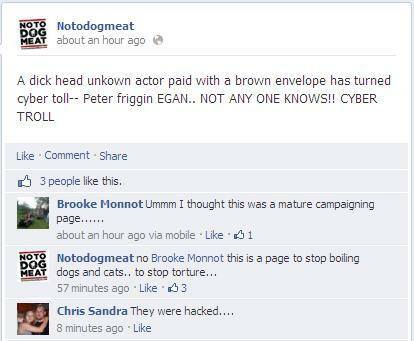 Notodogmeat have given up pretending that their FB Page was hacked. In a shocking statement this morning, their CEO is blamed for the threatening and defamatory posts made on their official Facebook Page. They report that she was intoxicated. The statement appears to have been made by somebody to whom English is a second language. There is reference to her Korean counterpart taking control. Interesting, we had no idea that there was a Korean counterpart in the management team of Notodogmeat. Equally interesting, is that they seem to be attempting to ‘sanitize’ their self proclaimed Campaign Manager Mr H by claiming that the CEO, Ms J de C, was the Campaign Manager. The good news is that they state they are no longer a Charity and will not in future ask for donations. There is no word yet on the merchandising side of the organization. For those without a Facebook account we will keep you posted. where you will be able to donate or buy merchandise, if you are so inclined. NTDM and their acolytes, to silence their critics, reported them to FB as fake identities. To verify their identities, and to have their accounts reinstated, FB requested private documents as proof of identity. Some of us have refused to do so, since we do not believe that FB should be trusted with such personal information. Others have responded to FB onerous demands but still have not had their accounts reinstated? Animal welfare pages have been stranded since their admin are banned from access. Valuable work on FB for suffering animals has ground to a halt. The people who launched this attack have many false identities but we were all taken down too quickly to protect ourselves from them. We have seen FB comments chortling about their success in removing their critics from FB. 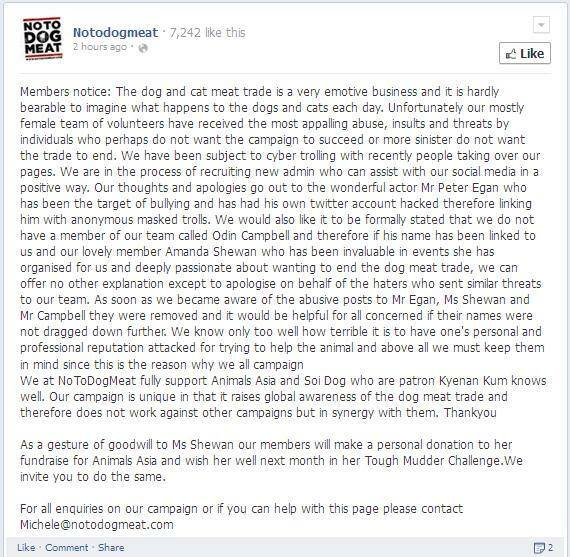 NTDM, bloated by their triumphant FB vendetta, then decided to launch a Twitter attack on Peter Egan, a much respected public figure in the UK, a tireless animal welfare activist and the ambassador for Animals Asia. 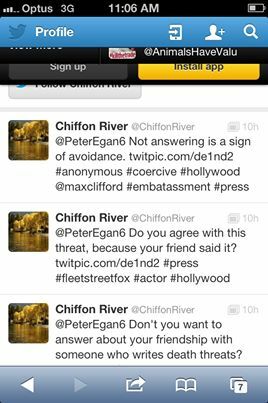 Why did they launch an attack on Peter Egan? Because he said that he did not support them. Peter was impelled to make this statement because NTDM have recently been using an old photo of him on their Facebook page and were heralding him as a supporter. In a spiteful attempt to smear his reputation NTDM attacked him by erroneously suggesting that he is linked to an individual who had posted a derogatory comment on Facebook. 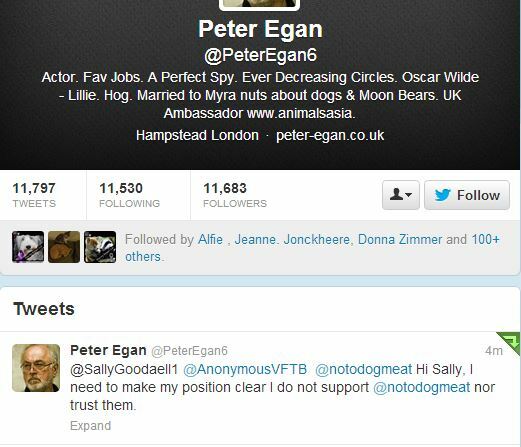 Peter Egan has a big following of supporters on Twitter. They are appalled at this attempt to smear his reputation. People, who up until now had not even known about NTDM, tweeted in protest. Until this much-loved and respected man was attacked in this way by NTDM on Twitter, they had no idea of the depths to which this ‘animal charity’ will sink to cover their traces. Peter, being the dignified man he is, responded to this vicious attack, He made a simple request. This sounded amazing. We couldn’t wait to join. Companion animal lovers shelled out their money in enthusiastic support. Tshirts, hoodies and kit was ordered and publicity material was downloaded from the ‘Notodogmeat’ website. Supporters cheerfully paid for the cost of printing, laminating etc. and travelling to protest and raise money. Wow they, these illustrious leaders, actually had their feet in the UK House of Commons. 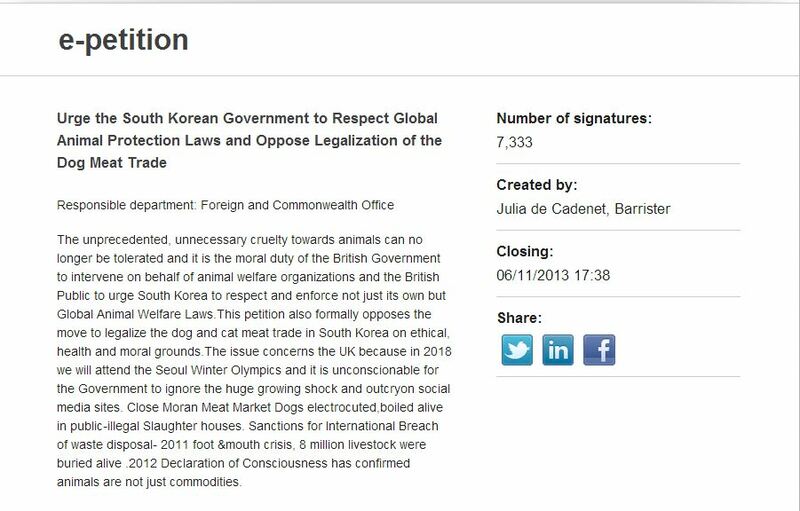 They were endorsed by the ‘International Coalition Against the Cat and Dog Meat Trade’, none of us knew who this important organisation was but it certainly read well. They even had their own, ‘pro bono’ lawyer ( or did they say lawyers) running the show? 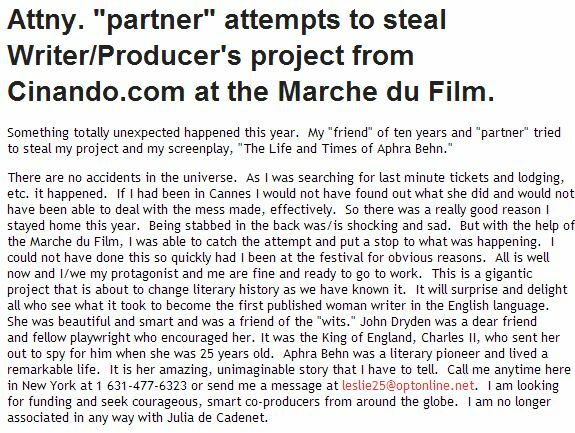 It was a bit confusing, but never mind, we were later told that they were taking their movie made by a, ‘leading investigative journalist’ to Cannes on 18th May 2013. Now that was exciting. We imagined celebs & movie stars coming out in support when viewing this movie accepted at the Cannes film festival,. 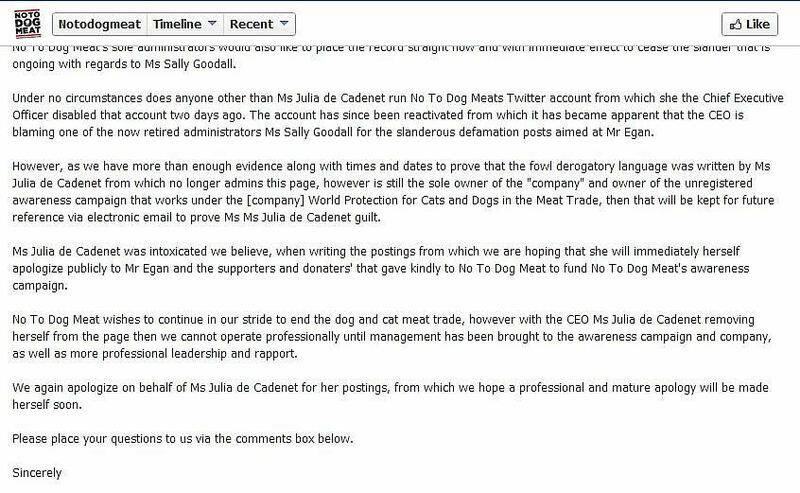 We were told that ‘Notodogmeat’ was founded by a Julia de Cadenet and Michele Brown (the ‘leading investigative journalist’). 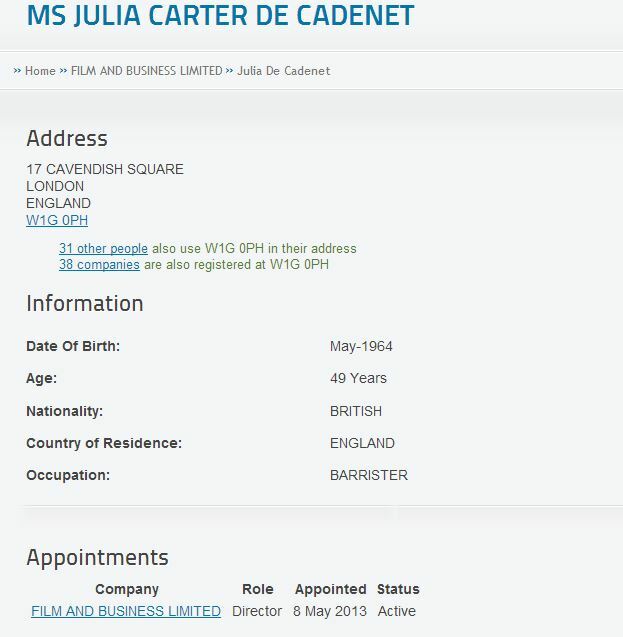 It was very disquieting to find the above information on Google about Julia de Cadenet! We began to wonder if a person who allegedly attempted to steal an intellectual property could be trusted with donors hard earned cash. 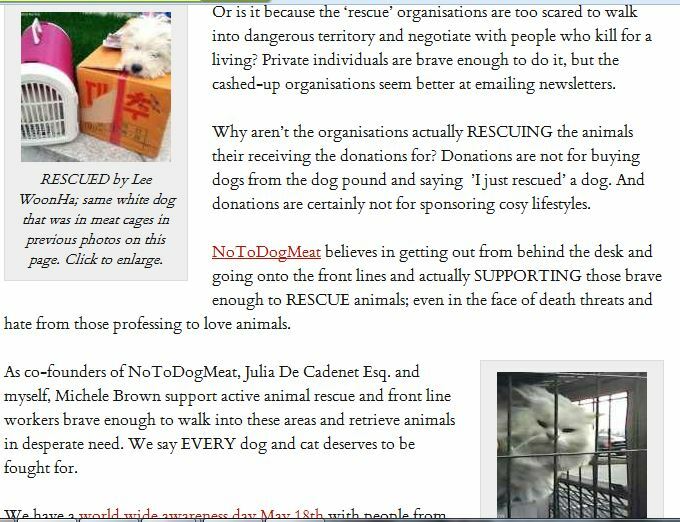 Ms de Cadenet, we discovered, was not only the co- founder of, ‘Notodogmeat’ she was also their much quoted, ‘award winning pro bono lawyer’. Even more intriguing was that Ms de Cadenet describes herself as a Barrister. Very difficult to believe that a Barrister would risk their professional status by trying to steal an intellectual property? There it is though.. the accusation is still on the web, with no injunction apparently served to remove the extremely damaging accusation. Mentions of Julia as a Barrister have for the most part recently disappeared. Although she describes herself as such on the UK petition she created. 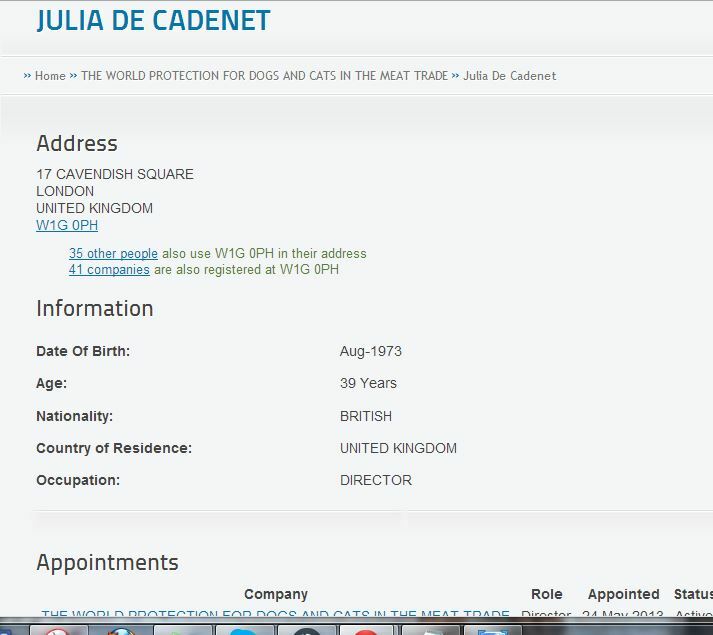 Strangely when registering, at approximately the same time, as director of, ‘The World Protection For Dogs And Cats In The Meat Trade’ Julia changes not only her profession (& alters her name) but also her birth-date by many years. Will the real Julia de Cadenet please stand up. By the way, the address shown on both these screen shots are of a virtual office and NOT of her private address or place of work. Attempted plagiarism, lying on an official government document, the plot thickened. As the figurehead of, ‘Notodogmeat’ this person was gathering more and more FB supporters willing and eager to supply her with money. Misleading posts went up on the official FB page, only to be quickly removed when queried too closely. 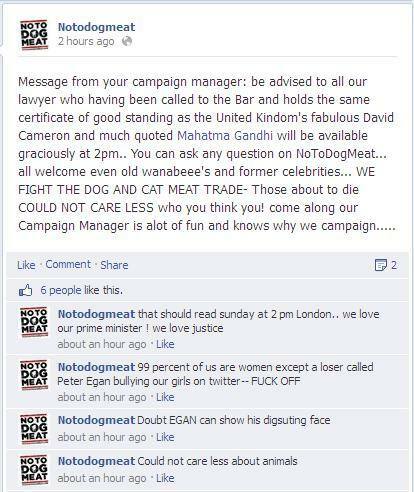 It became clear that, ‘Notodogmeat’ had more than Ms Brown & Ms de Cadenet as co-founders. Mr David Merrill is a fellow officer in the UK registered company, ‘The World Protection For Dogs And Cats In The Meat Trade’, the so called ‘umbrella’ for Notodogmeat. We breach no privacy in stating that since that information is freely available on the site http://www.companiesintheuk.co.uk . 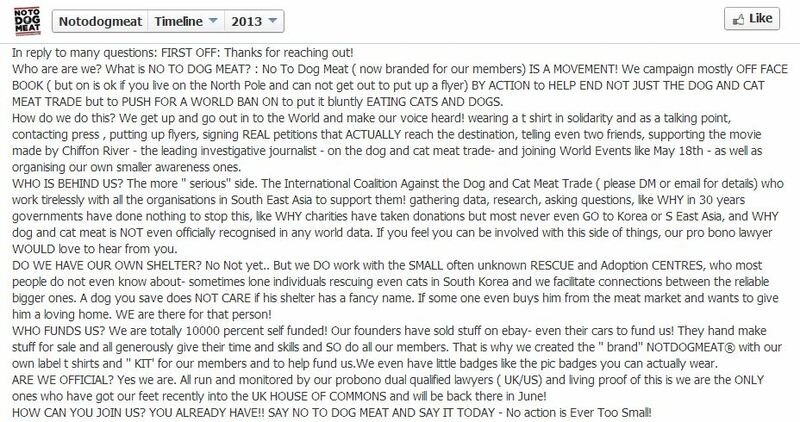 Mr John Hughes is their self-acknowledged Campaign Manager, and has been so since ‘Notodogmeat’ hit the ground running in March 2013. The much earlier quoted, ‘International Coalition Against the Cat and Dog Meat Trade’ never did exist. The above information, as it emerged, became very interesting to a number of us. 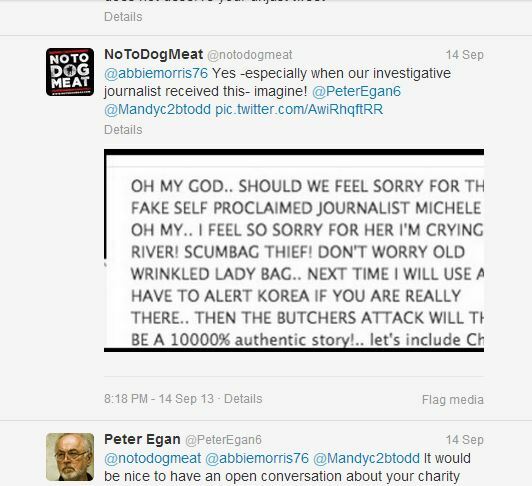 What really alarmed us was when we began to see snide, disparaging remarks made by, ‘Notodogmeat’ leaders and their acolytes. 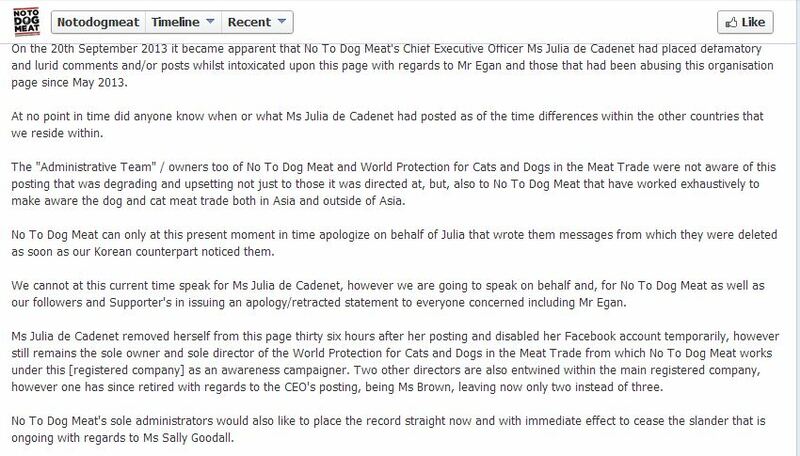 These remarks were directed at discrediting, Soi Dog Foundation, Animals Asia, HSI and the FaceBook Page, ‘Hand in Hand with Asia’s Animal Activists’; AND by inference any other organisation fighting against dogs & cats for human consumption! Soi Dog Foundation seems to be a pet hate of theirs. 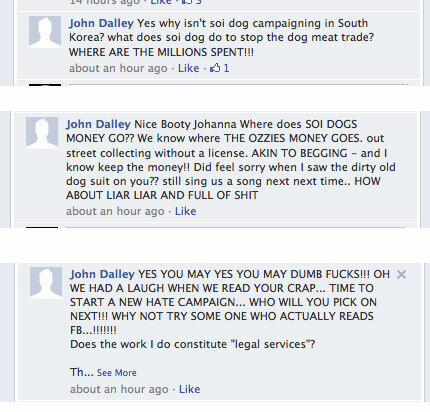 This is one of them with a fake FB account pretending to be John Dalley of Soi Dog! The numbers grew of people recognising that something was very wrong with this animal ‘charity’. 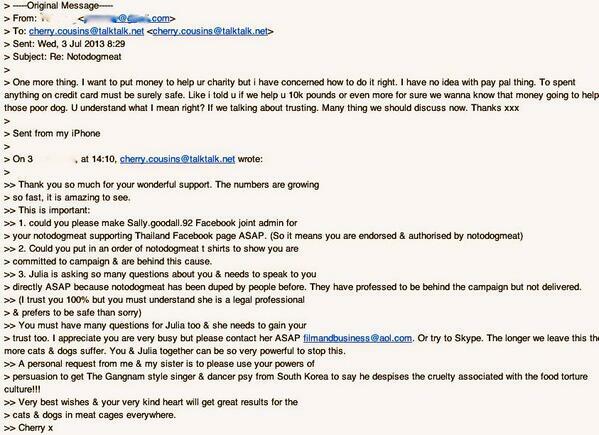 Credible animal charities distanced themselves and groups of FB members began to investigate further. Donors began to complain that they had been ignored when requesting receipts. 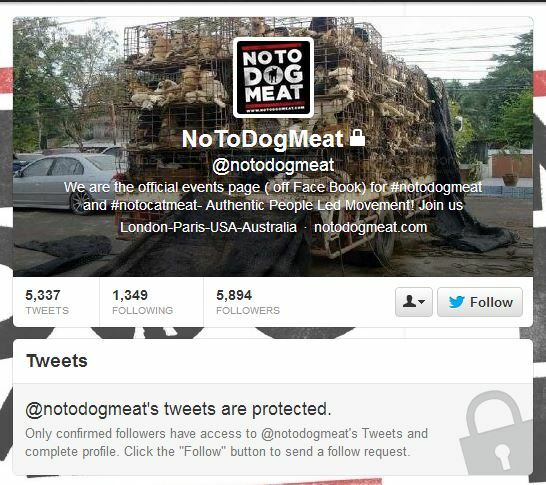 Supporters reported that ‘Notodogmeat’ were indifferent to the hard copy petitions they had so tirelessly collected. Questions were raised about their true charitable status and about where donations were going. That is when the, ‘dirty tricks against critics’ campaign started. 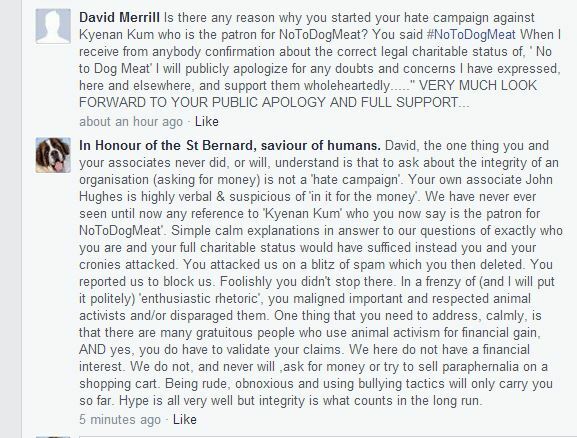 Shockingly two notorious, ‘bad lads’ (and their faithful acolytes) of FB animal charity scams, crawled out of their troll caverns to attack the critics of, ‘Notodogmeat’. 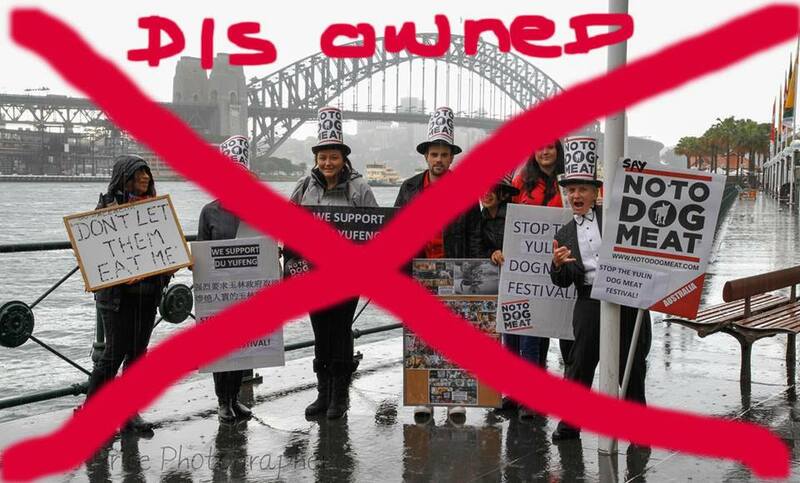 Were they always part of, ‘Notodogmeat’? 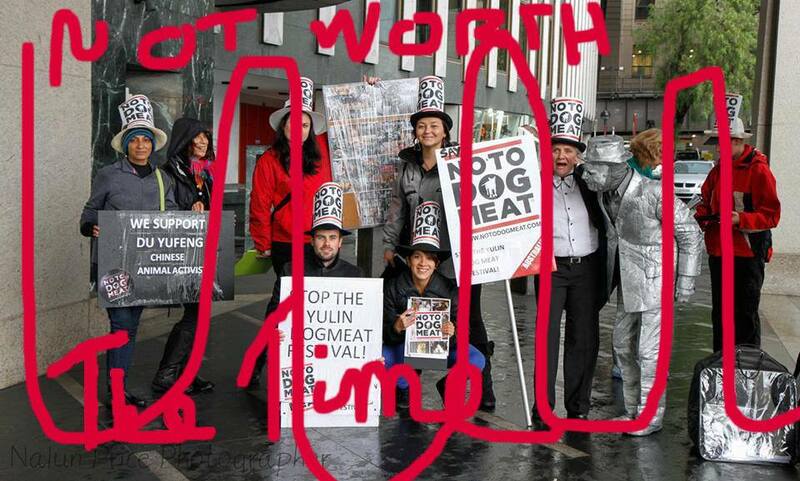 Is ‘Notodogmeat’ in fact one of their many scams? If not, why on earth would they bother to attack so viciously on behalf of an organisation in which they have no financial interest? In Chapter 2 we will report further on concerns about ‘Notodogmeat’. This Just In- We have posers.